Micki here to share a little card project, which was a lot of fun creating. 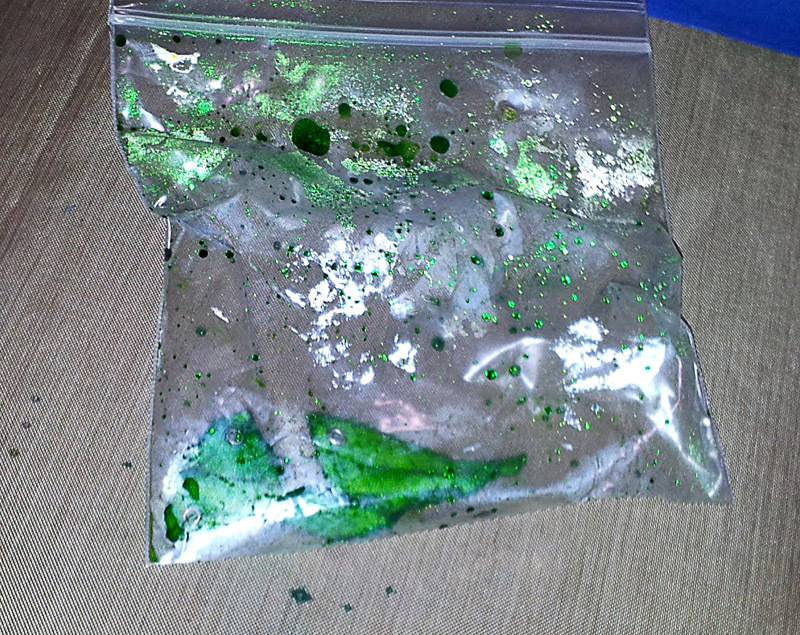 Those of you that have followed my crafting adventures, know that I tend to get carried away when playing with new ‘toys’ or techniques. Definitely not a bad thing, it’s just that I tend to have lots of “extras” that I try to incorporate into my cards or projects. Now, that may not sound like a big deal to some but for me - who never really has a clear vision in her head when starting a project – it can be a major mojo killer J. 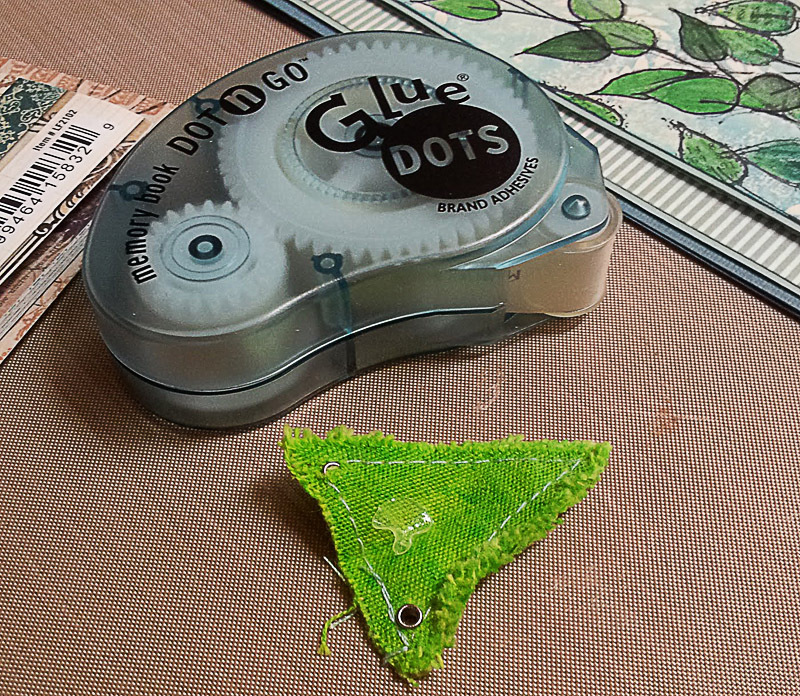 The one thing I knew for sure as I started was that I definitely wanted to use papers from My Mind’s Eye - Lost & Found 2 Breeze 6x6 paper pack (love the blue/greens), TCW’s - Mini Leaf Grid template and Maya Road’s Mini Triangle Banner. 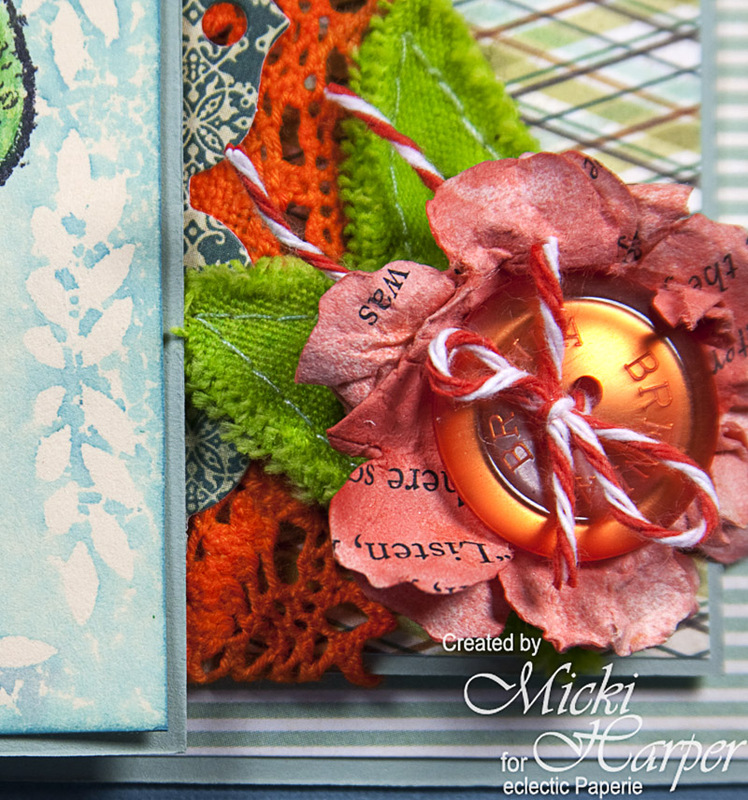 Taking my color cue from MME’s Lost & Found 2 Breeze papers, I grabbed a #5 Manila Tag placed the Mini Leaf Grid on top and then applied Salty Ocean and Mowed Lawn Summer Seasonal Distress Ink with my Foam Blending Tool. And because it is after all …. me….I had to trim the top of the tag to hide a boo-boo J. Next I got out my - Squeezed Orange & Fresh Lime Dylusions Ink Spray and spritzed the Mini Triangle Banners in Fresh Lime. The trick is to really soak the canvas and making sure every part is soaked, I basically use the banners like a rag wiping up any excess ink. After my fingers were really ( and I mean) really ink covered I remembered to use a sandwich baggie, which works just as well. I did the same thing to apiece of old cotton lace (found in my quilting stash I forgot I had) with the - Squeezed Orange Dylusions Ink Spray. I had some left over paper flowers (made from old book pages), which got the same treatment as the cotton lace, only I lightened the color a bit by spritzing with water. 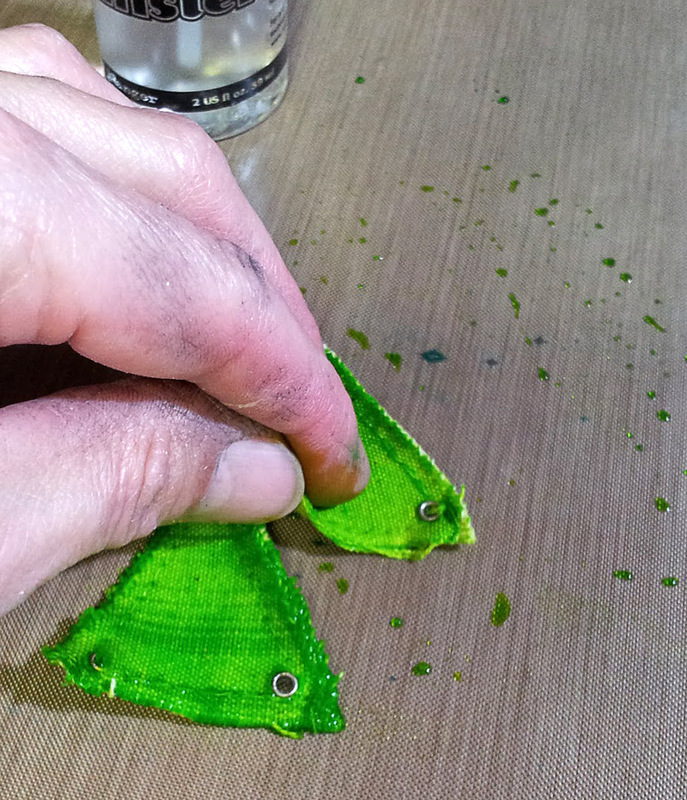 Don’t laugh, but what I am really excited about is the Mini Triangle Banners that make PERFECT leaves! 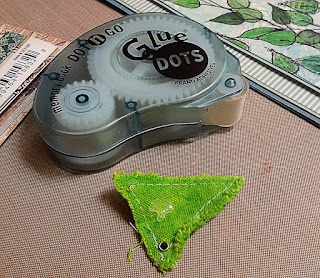 Adding a Dot N’ Go – Memory Book Glue Dots to the center of the canvas banner and then squeezing the sides together helped create the leaf shape. 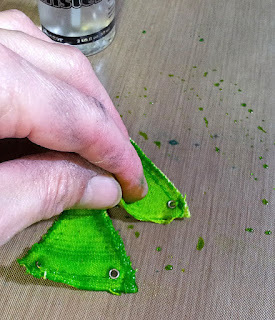 While that was drying, I stamped the leaves from Dylusions-Further Around the Edge onto the stenciled tag and colored each leaf with a colored pencil and blender pen. 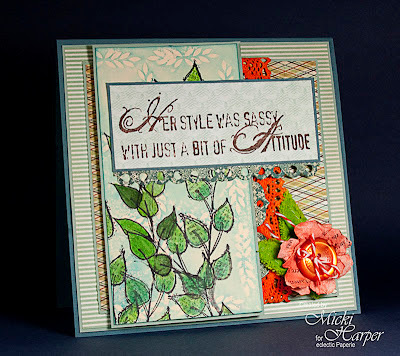 The sentiment from Dylusions-Further Around the Edge was stamped directly onto MME’s Lost & Found 2 Breeze paper. 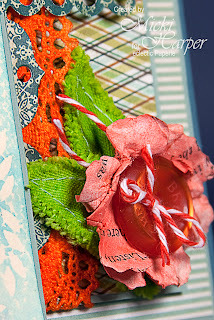 I used 2 of the scalloped edge dies from Spellbinders Banner Basics One set, a Buttons Galore - Tangerine Tango button along with some Cantaloupe twine from The Twinery and I was really, really happy with the end result. Lots of fun incorporating new and some old supplies and I hope this inspired you to get inky! Be sure to stop by the eP shop – new product arriving daily! AAAHHHH!!! I'm squealing Micki! this is stunning! The banners as leaves? Pure genius! Beautiful work! Micki, this is exceptionally fabulous, my dear! I love everything about it and the fact that you explained your process was a great bonus! Love this!!! I love it ... love the ideas! 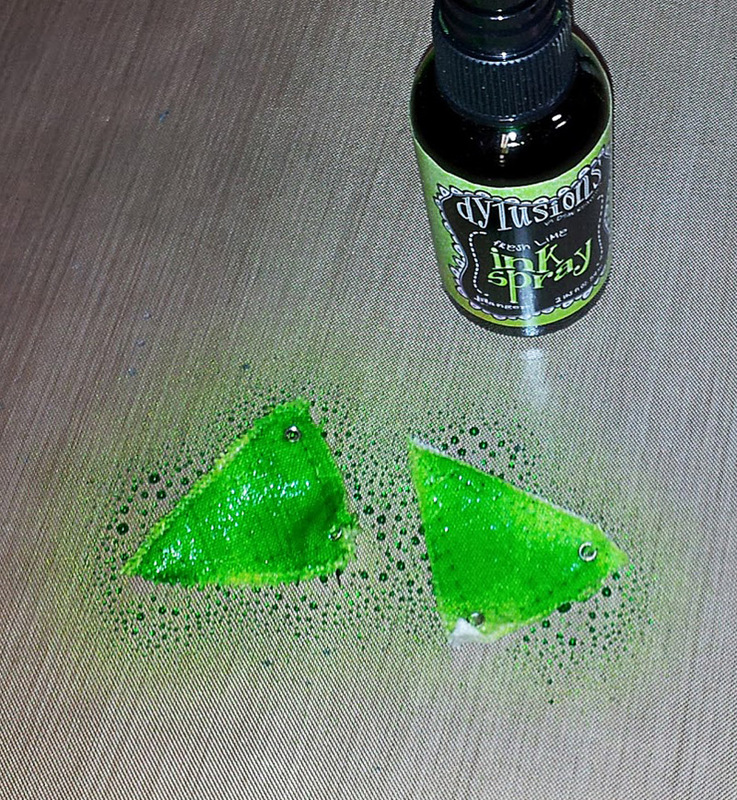 Love how you used the spray ink! LOVE this!! And I feel that the sentiment fits you to a T! !